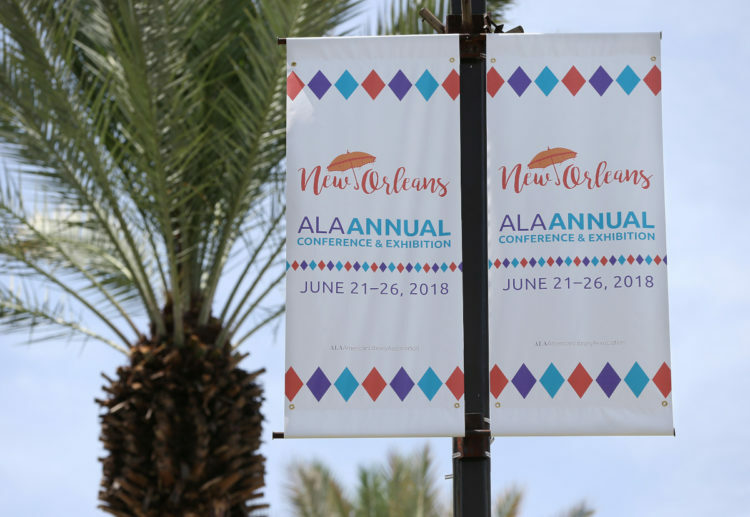 Our team is back from ALA Annual in New Orleans, where we presented some of our findings, conducted more research, and learned more about some of the awesome things happening in programs that occur across all types of libraries. Here are a few of the sessions we attended relevant to program design, development, and facilitation in libraries. Many school libraries face a challenge for programming that other library types do not: scheduling constraints. They can’t count on student access outside of school hours, and students don’t have much free time during the school day. That means that school librarians often need to partner with teachers to create space for programming during the school day, and most drop-in programming happens during lunchtime. To the extent that school librarians host drop-in programs, they are student-driven. These librarians wanted help determine the needs and interests of their students; one idea for progressing this work was training in facilitation skills. This event described a partnership between a library and a local nonprofit, working together to teach video production to teenagers as a way of building teamwork, developing analytical and creative problem-solving skills, and addressing the digital divide. The program grew from a single camp session to a series of ten camps a year, and demonstrated the value of partnerships where libraries host programs primarily developed outside the library. The teens have “hands on” experience during every step and are encouraged to learn through both success and mistakes. They are given editorial control to make all decisions about content and story development, and emphasis is on the learning rather than the finished product. Each library hosts a culminating event for the community to showcase the teens’ work, helping them develop speaking and presentation skills. 1. Professional expertise is an important source of evidence. Patron data, including surveys and demographics, is valuable – but patrons are not the only ones who can speak to what’s happening in the library. Librarians’ and other practitioners’ expertise also has a role to play. The speaker who made this point encouraged librarians to think beyond collections and attendance statistics to ethnographic field notes within the library and structured debriefing sessions with other staff members. 2. It’s hard to evaluate something if you don’t know why you’re doing it or how you think it should work. One public library system created an easy-to-use logic model template for their staff to use alongside a new strategic plan. For every program, including long-running ones, they thought staff should be able to articulate why they are doing the program as well as the impacts they expect it to have. These two events were similar, providing case studies from libraries and programs that work extensively with immigrants and refugees. Several presenting librarians emphasized that programs and services go hand in hand. The success of their programs depended on collections development to ensure that immigrant languages and cultures are represented, as well as extensive outreach to make sure they were meeting the community’s needs, and inclusive staff recruiting practices so that the library mirrors its surrounding community. For example, the Louisville Public Library started an English conversation club after learning that resettlement agencies did not always provide childcare during intensive English classes. They also offer multicultural music lessons, citizenship ceremonies, interfaith iftars, cultural showcases to teach the community about immigrants’ home countries, and many other programs. Librarians in these sessions argued that running multiple related programs helps create a stronger sense of community: the large number of related program types means there’s something for everyone, and because people feel welcome many of them attend multiple programs. Did you or any of your colleagues attend the conference? What stood out to you about programming?